Then I scrolled down, saw the ‘forfeited’ counter, and began wondering whether these companies could be forced to stop making forfeiting part of their contracts. It’s truly not like this is a technical problem. This is a business decision they’ve made to let bandwidth you’ve bought artificially expire. So that’s R3700 of “forfeit”, for no reason other than someone decided it’d be a good way to make money. And, as far as I know, all the operators in this country do this. For the less technical readers: as I mentioned before, there’s no technical reason this happens. It’s just an entry in some database, and can be updated. 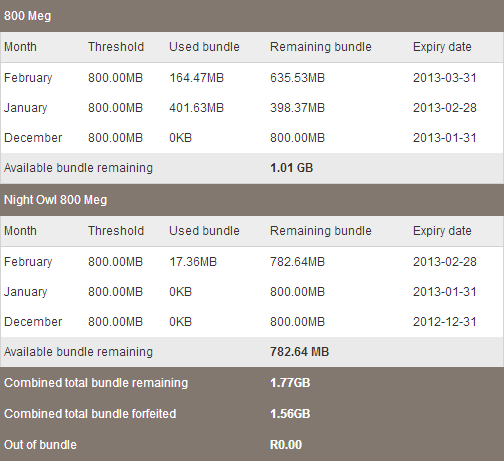 If anything, maintaining an expiry time on data probably leads to more technical issues than they’d otherwise have. To compare, this would be like anyone buying up a bunch of things (toilet paper, toothpaste, whatever), and the storekeeper then removing it from your home if you haven’t used in soon enough.